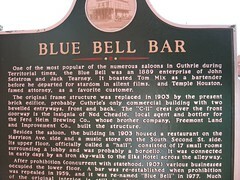 One of the most popular of the numerous saloons in Guthrie during Territorial times, the Blue Bell was an 1889 enterprise of John Selstrom and Jack Tearney. It boasted Tom Mix as a bartender before he departed for Stardom in silent films, and Temple Houston, famed attorney, as a favorite customer. bevelled entryways, front and back. 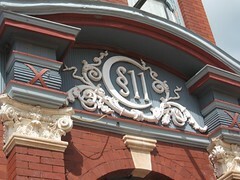 The " C-11" crest over the front doorway is the insignia of Ned Cheadle, local agent and bottler for the Fred Heim Brewing Co., whose brother company, Freemont Land and Improvement Co., built the structure. 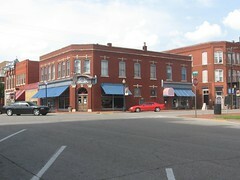 Besides the saloon, the building in 1930 housed a restaurant on the Harrison Ave. side and a music store on the south Second ST. side. Its upper floor, officially called a "hall", consisted of 17 small rooms surrounding a lobby and was probably a bordello. 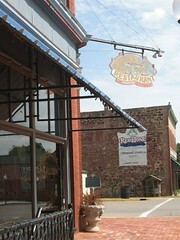 It was connected in early days by an iron sky-walk to the Elks Hotel across the alleyway. After prohibition (concurrent with statehood, 1907) various businesses occupied the lower floor. 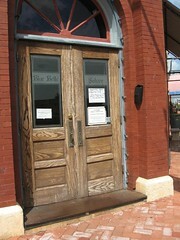 A bar was re-established when prohibition was repealed in 1959, and it was re-named "Blue Bell" in 1977. Much of the original interior is still in place. 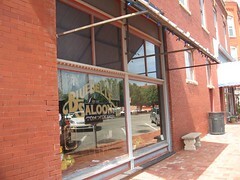 Now the name of the building is the Blue Belle Saloon.